Joe Simon and Jack Kirby needs no introduction as the powerhouse partners in comics that rose to prominence during the Golden Age of Comics. They are not just prolific but also a great influence on other artists. 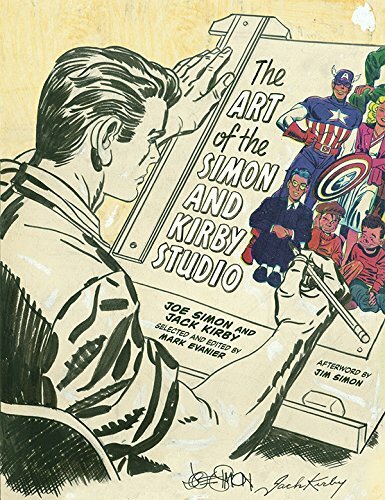 The Art of the Simon and Kirby Studio is a huge 384-page hardcover that features selected work they have created over 30 years. It's not an artbook but sort of like an omnibus. Writer and historian Mark Evanier, who apprenticed with Jack Kirby, wrote the introduction and selected the comics included. The bulk of comics included are in their entirety covering genres such as western, crime, war, romance and sci-fi. Noticeably missing are the superhero-related comics. You may remember another book called The Best of Simon and Kirby that was published in 2009 by Titan Books. That book features more famous creations, such as Captain America, while this book features the lesser known titles, many of which have never been published before. The comics are actually photographed or scanned from the original comic pages. It's quite cool to actually see the corrections done, such as drawings over white-out areas, the faint lines used as reference for writing the text, portions of the panels being pasted over with bigger pieces of paper with bigger corrected drawings, the yellowing clear tape, etc. The reproduction is quite well done with the raw pages reprinted in high resolution and huge. The comic art is fantastic of course. For fans of Simon and Kirby, it's a very worthwhile purchase together with The Best of Simon and Kirby.